Piper is a white fox with a light blue chevron pattern all over her. She has large, glittery blue button eyes and a black button nose. Piper has a white lower jaw and belly and black ears and feet. The inside of her ears are shiny and bright pink. So stay my friend throughout the years! Piper was released in January 2017. Her Birthday is on 6th April. 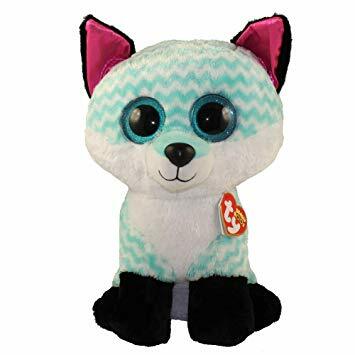 Piper is a Claire’s exclusive Beanie Boo. There are four versions of Piper. This large 16″ version, a small 6″ Beanie Boo, a medium 9″ Beanie Boo Buddy and a key clip.